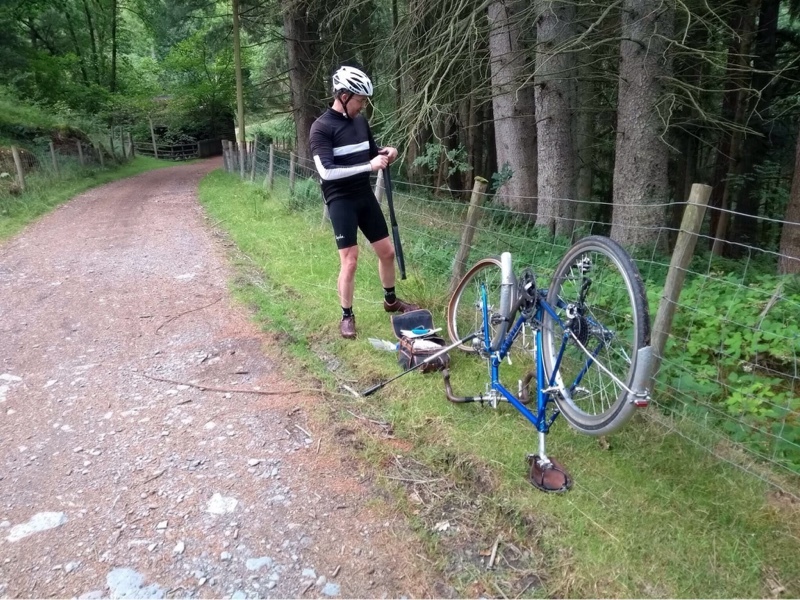 The blog has returned, but we are no longer cyclotouring, cyclogîting, cyclohoteling (delete as appropriate) - we are cyclovaning whatever you want to call it. I am the man with the van and S is the lady in the van - but not looking at all like Maggie Smith. And the plan with the van is to travel to out-of-the-way spots and do a bit of cycling; the South of France, Spanish undiscovererd hinterland, the Adriatic coast . . . I mused as I dreamt of sunny climes, grapes ripening on the vine, and campsites set deep in alpine forest glades . . .
'I want to go to Scotland', exclaimed S. 'I've never been and it's supposed to be beautiful'. Now, as regular readers will know, beauty is in the eye of the beholder, or at least depends on the day and time of year when you happen to be beholding. Indeed Scotland is beautiful; I said as much as I bored S with tales of cycling through the highlands during my LEJOG of distant memory. But it is Scotland, with possible stair-rodding rain, Beaufort defying gales and . . . MIDGES. But we have had a summer of endless blue sky and baking hot temperatures - 'the best since '76' you will hear people of a certain age banging on about. So the gods seemed to be smiling on us . . . I joined up with a well known camping club (others are available), booked an itinerary, and we set off north. First stop, to get S into the idea of what Scotland is like, was . . . This small mid-wales town is in the middle of nowhere. 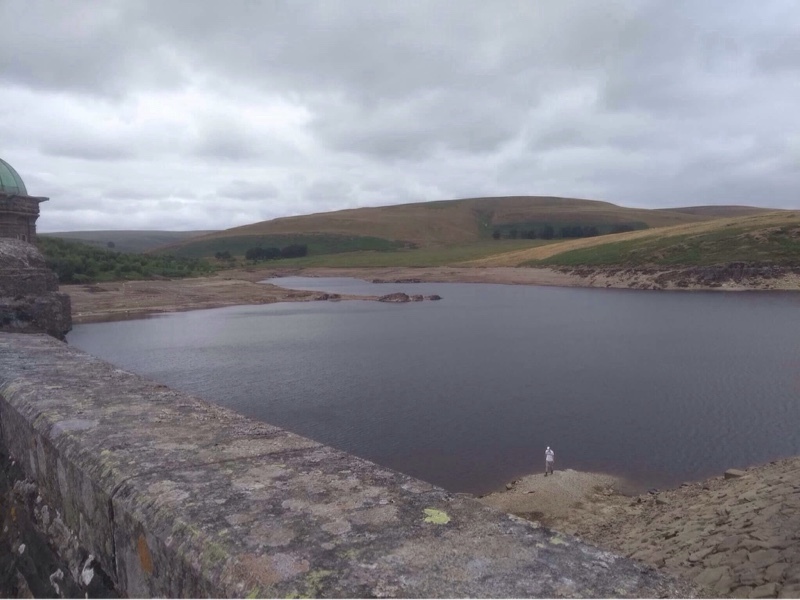 I last visited to take part in a 100 km audax around a series of desolate reservoirs, into a perpetual headwind which changed direction from one valley to the next. 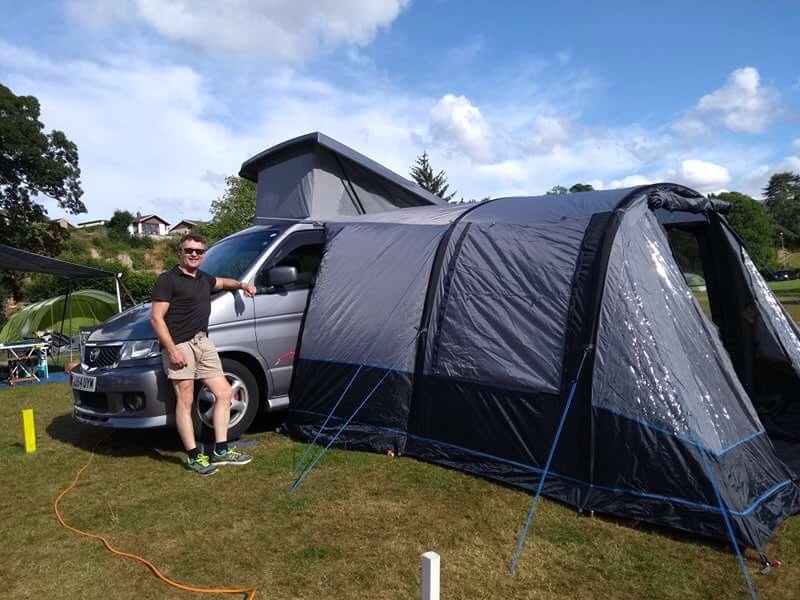 My only previous visit was at the age of 10 when we stopped there on a family camping trip In a site next to the R. Wye and, in one of those cyclical events that besmatter life like the spray from S's rear wheel, we have pitched up in the very same spot. 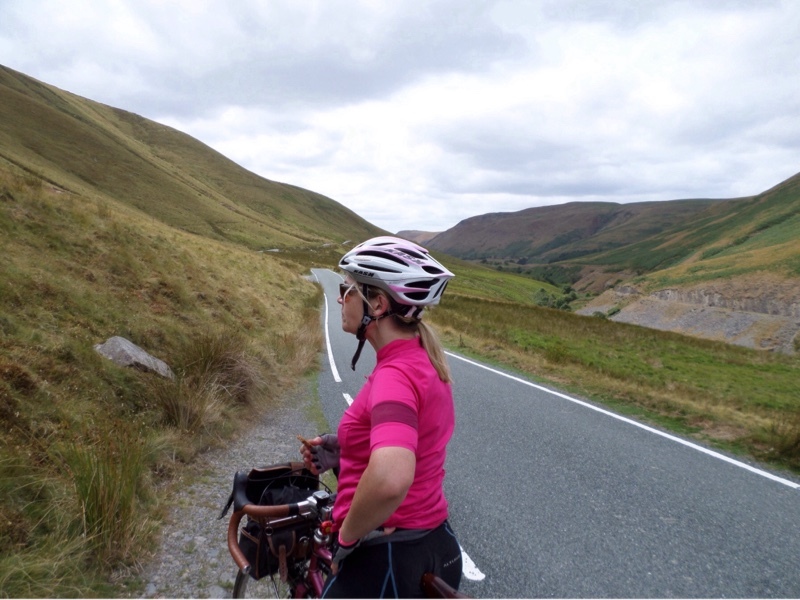 Mid-wales, is sparsely populated . . . except for sheep and water. Rhayader is a small market town, but with an overabundance of pubs of dubious quality. For the 7 years we went cycling in France we only had one duff meal - moules in Quimper - but the Crown Inn in the middle of town managed to serve me up raw lamb's liver. Now, reguar readers will know that I'm not a fussy eater and quite happy to go along with modern penchant for barely cooked meat - but raw liver????? So I got a refund and went across the road for pie and chips. So, to the cycling. 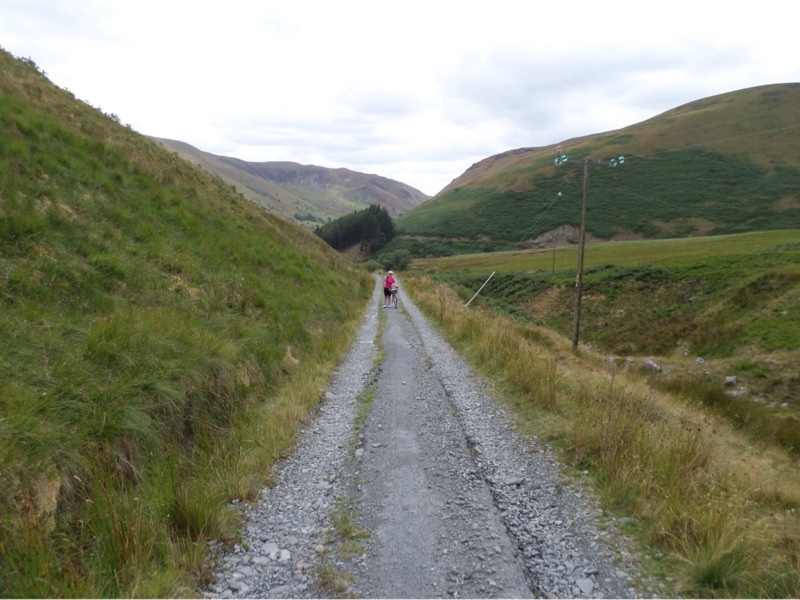 S had found a map of the Elan Valley trail, which wound its way along the old valley railway line past a series of reservoirs in very scenic fashion . . .
Having purchased some buns at the local cafe we set off on a leisurely ride along the cycle path, taking in the beautiful scenery, until the first 'Scottish Play' of the tour . . .
H: 'Much like this really, up and down, it's Wales'. Much later when we had to turn round and go back the way we came . . . So now that we are talking again I am preparing the next adventure . . .